Here I am again. Wait, it is 2013 already, March? This must have been the longest time I have not been blogging. I must confess, I was even contemplating whether I should post again after such a long break. But I could not stop thinking of my blog. I have been missing it a lot. One of the reasons for my absence was that I have been quite busy with my work. I am incredibly grateful for that. I really love and enjoy my job and the more I work, the more I love it. This week I finished shooting a second cookbook so I finally have time I can devote to my blog. If you follow me on Facebook or Instagram, you might have caught some behind the scenes photos from the first cookbook shoot I did before Christmas. My dear friend Bethany from Dirty Kitchen Secrets will have her debut cookbook The Jewelled Kitchen out this summer. I was very honoured to photograph the book. I obviously tasted many of her recipes and can honestly say it's a book you don't want to miss if you are interested in Middle Eastern cuisine. The book will be available for preorder very soon, so stay tuned for more info. If you read this blog you know I never post complicated recipes. I like simple recipes bursting with flavours. Nothing has changed in 2013 and my next recipe is also fast and simple. Fresh flavourful salad was exactly what I needed after my Saturday Pilates class. I was home alone and didn't feel like cooking a proper lunch. On my way home from the class, I stopped at our local fishmonger's and bought a piece of my favourite honey roasted salmon and some fresh eggs. I just added fresh mixed leaf salad and lunch was ready. Put all ingredients for the dressing in a small jar with lid and shake well until mixed. You can keep any leftover dressing in the fridge. Add a little water into a medium saucepan (fill the saucepan about 1/3 or so), pour in the vinegar and bring to the boil. Break an egg into a small bowl. When the water is boiling, reduce the heat to minimum. You want to see only tiny bubbles on the bottom of the pan. Create a whirlpool with a spoon and carefully slide the egg in the middle of the pan. Cook for 3 minutes (if you like runny yolk). Remove the egg with a slotted spoon and drain on a kitchen paper towel. 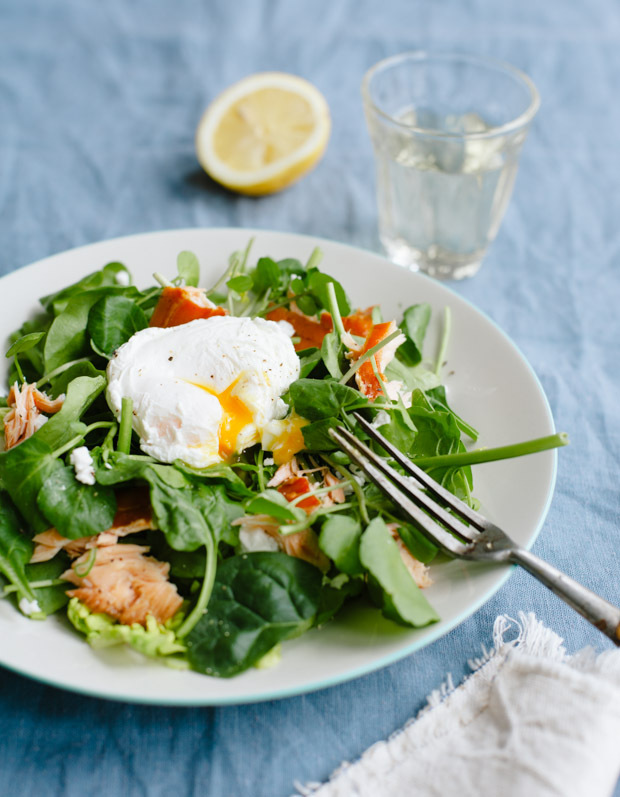 In a bowl, mix 2tbsp of dressing with the mixed salad leaves and spring onion. 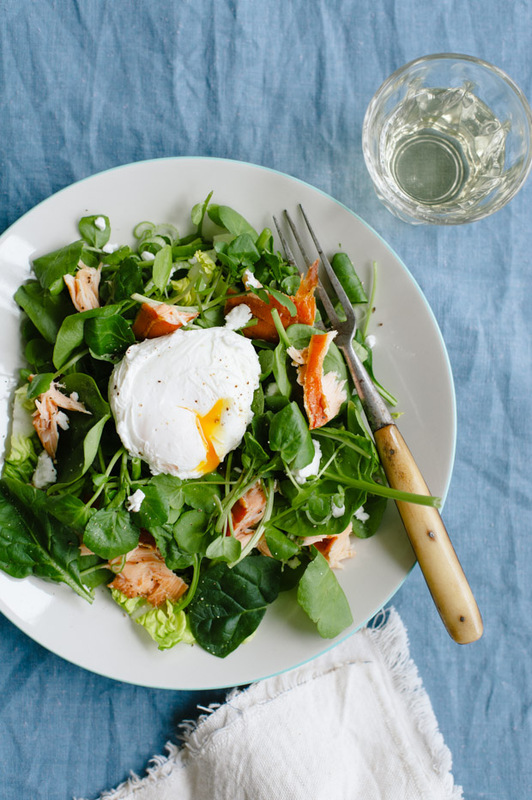 Arrange the salad on plate, scatter the feta/goat cheese and salmon over and top with the poached egg. 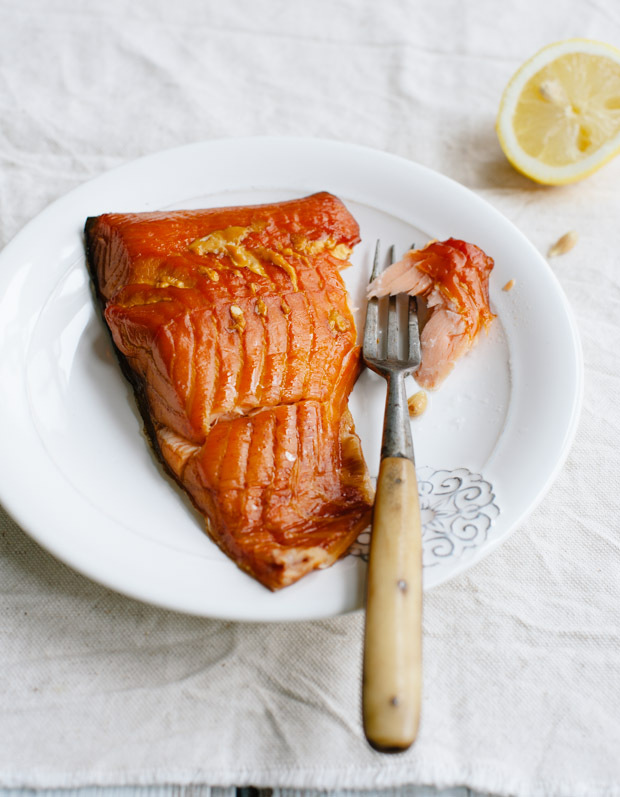 Note: You can substitute the honey roasted salmon with a regular smoked salmon.